A huge blaze broke out at The Address Downtown Dubai last night, several hours before the emirate’s New Year’s eve fireworks were to take place. 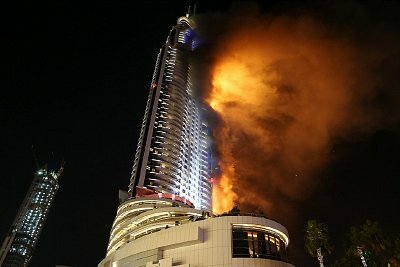 Videos and pictures of the fire, just behind The Burj Khalifa, began flooding social media sites as soon as word spread. Mohammed Al Sarraf, a Kuwaiti businessman who came to Dubai to celebrate the new year with his wife, said the fire spread quickly. “It’s raging,” Mr Al Sarraf said. “It’s gotten so much bigger in five minutes. It’s gone from just a small fire at the foot of the building and now it’s shooting up the middle and the top. Civil Defence were on the scene shortly after the fire began, several hours before a large fireworks display was due to take place. The Dubai Waterfront was evacuated, with many visitors being moved into The Dubai Mall while the fire was tackled. Mr Al Sarraf said he noticed the fire from where he was seated after he smelled smoke. Ahmad Al Bader, a restaurateur who was at The Burj Khalifa with friends, watched as the fire took over the entire building. “I saw the flames just as it started and now it is out of hand. I can’t see anything because of the smoke,” he said. Mr Al Bader said his family were at The Waterfront having dinner when the area was evacuated. “They evacuated the people in the Address. My uncle and aunt were having dinner there and they were quickly rushed out, it’s crazy,” he said.